Not enough movies try to be socially relevant. Even less do it in a way that doesn’t come across as grating or forceful. Surprisingly though, Zootopia feels purposefully made for the now, the past, and hopefully not the future. And I say that because at the center of this scintillating lollipop of a family film is a multi-faceted message that resonates. It tackles racism, political corruption, gender roles. They’re all problems we’ve read about in history books, as well as the pressing issues that we’re still dealing with today. Disney’s latest pleads with us to put a stop to all the hate and the fear and cruelty, advocating for peace through the actions and the voice of a cute little bunny. What a fun movie this is, and what a crusade to champion. Ever since she was little, Judy Hopps (Ginnifer Goodwin) has had a love for the law. Out in Bunny Burrow though, the family trade is farming. She’s put down by bullies. Both parents press her towards complacency and following their footsteps. But Judy is determined, willing to be knocked off of her horse and get back up again. No bunny has ever been a cop before, and yet she graduates top of her class, then placed in Zootopia’s first precinct. That’s this film’s version of a metropolis. A place she has always dreamed of, where predators and prey have “coexisted” for years. Upon arrival though, Judy must deal with constantly being undersized, underestimated, and underwhelmed. 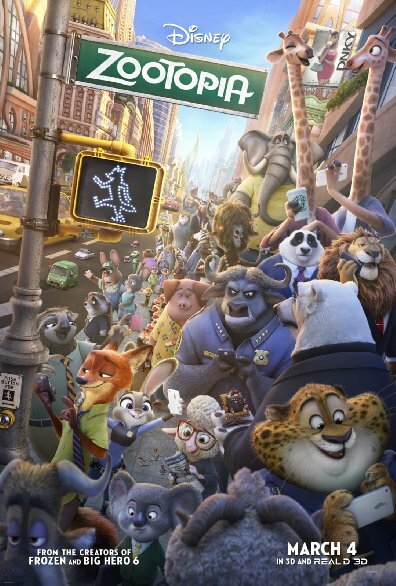 Zootopia starts as another bright-eyed and bushy-tailed dreamer heading to the big city. All of that changes upon meeting a con artist fox named Nick Wilde (Jason Bateman). From there it’s your standard buddy cop comedy, almost like a less hard-boiled version of 48 Hours without the foul language. Judy weasels her way into a missing person’s case, thus convincing the street savvy fox to help her as a pardon for his life of petty crime. Bateman and Goodwin are perfectly cast and compatible as the leads. One sprite and the other smart aleck. Zootopia’s only misfire seems to be the middle’s noir-esque tone. I see a lot of the material going over the heads of kids. But its confectionery visuals don’t sugarcoat the themes at play, so as children revisit the movie for the lovable anthropomorphic animals, they’ll clue into the little details. The what, who, how, and why of it all. Maybe when they’re on the playground or in the cafeteria – two places notoriously divided into subgroups – they’ll remember the film’s message. Adults just as well too, whether at the workplace or home or anywhere for that matter. You don’t kill with kindness. You love with it. All in all, Zootopia encapsulates what a family movie should be. One scene in particular shows just how much thought and balance was put into pleasing both sides. The leads enter a DMV to track down a license plate. Low and behold, the employees are all sloths. Kids will laugh at the perfect physical humor while adults crack-up at the associations. Still, some parts felt odd; like a nudist animal colony or an underground growing facility that’s clearly a metaphor for marijuana. But with an impressive cast, incredibly thorough art direction, and a voice worth listening to, Zootopia is a teaching tool for kids. They’ll learn animals names, behaviors, and the ramifications of choice. It follows through on nearly every critiquing statement that it makes, always sure to practice what it preaches.